Switzerland in winter is synonymous with skiing. 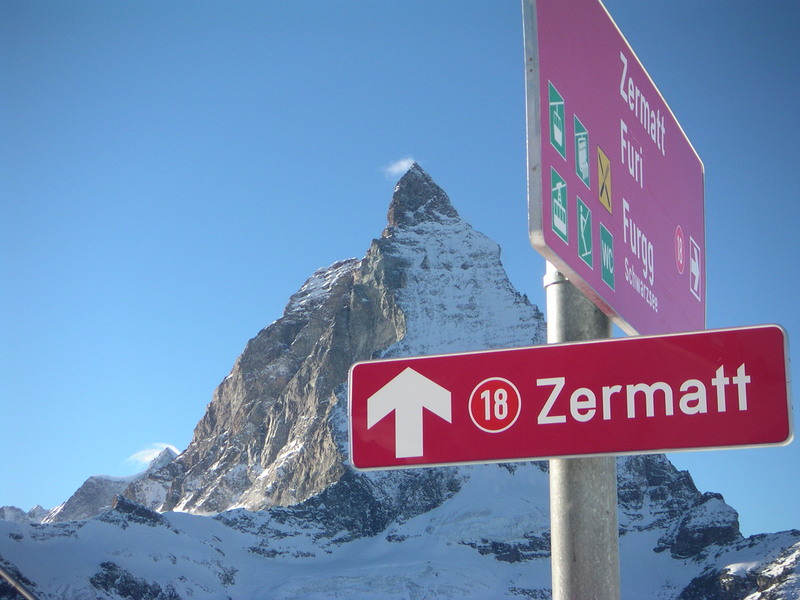 And Zermatt offers some of the most exciting terrain you’ll find in the Swiss Alps. You’ll also enjoy some of the best après ski and fine dining of any ski resort. Where else can you enjoy a traditional Swiss cheese fondue after an amazing day of shredding powder? This charming car-free village sits at the foot of the majestic Matterhorn and has been attracting ski enthusiasts since the mid-19th century. Whether you like to snow plow down blue runs or challenge yourself on daring blacks, Zermatt offers ski runs for everyone, and all come with gorgeous views of the Matterhorn. 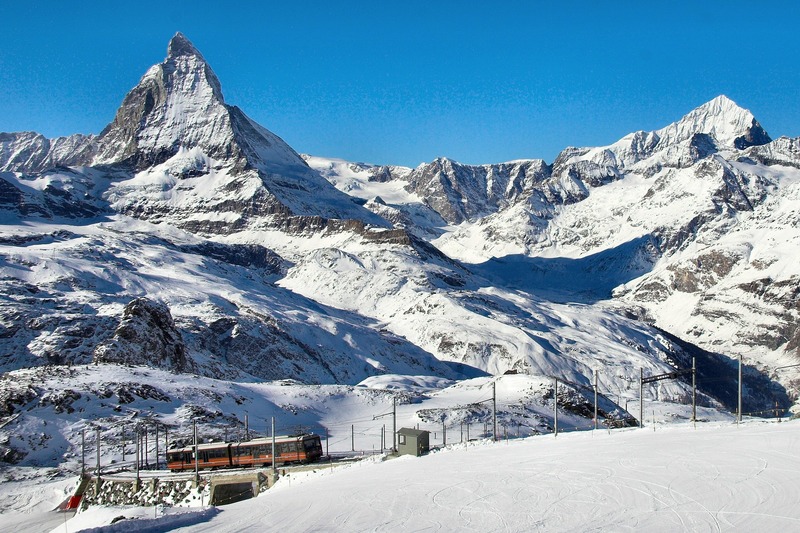 While views of the Matterhorn from the ski slopes are remarkable, the Matterhorn Glacier Paradise, Ride Europe’s highest-altitude cable car, is the premier way to experience the stunning scenery. Once you reach the viewing platform, you’ll enjoy 360 panoramic views of 14 glaciers and 38 peaks over 4,000 meters (that’s over 13,000 feet!). For the adventurous, Zermatt offers heli-skiing and for those romantic night owls, don’t miss out on a breathtaking moonlight descent. When you want a break from the ski slopes, Zermatt offers much more in the way of winter activities: toboggan rides and snowshoe hikes are just two. The best way to arrive in Zermatt is on the Glacier Express train. You’ll get million-dollar views as you ride this popular narrow gauge train. Traveling between the resorts towns of St. Moritz and Zermatt, it crosses 291 bridges and goes through 91 tunnels. It passes through the UNESCO World Heritage Site of Abula, the Rhine Gorge with its famous jagged landscape. If you’re lucky enough to be there on New Year’s Eve, you’ll enjoy an epic celebration. The old Church Square in Zermatt is the place to be at midnight. The open air festivities include fireworks, plenty of bubbly, and live music well into the wee hours of the morning. Traditionally, Swiss celebrate the New Year twice in a year, as Switzerland follows the Julian calendar. So if you miss the December 31st celebration, you can also celebrate on January 13th! Whether you are on the slopes or enjoying après ski on one of the many outdoor terraces, Wireless Traveler can help you stay connected. Our global satellite phone is particularly valuable while you are on the slopes or if you plan to do any remote skiing. As long as you can see the sky, you can make and receive calls and text messages. Our high-speed Pocket WiFi Hotspot will help you upload the amazing pictures you are sure to take. With the hotspot, you can easily share them on your favorite social media. 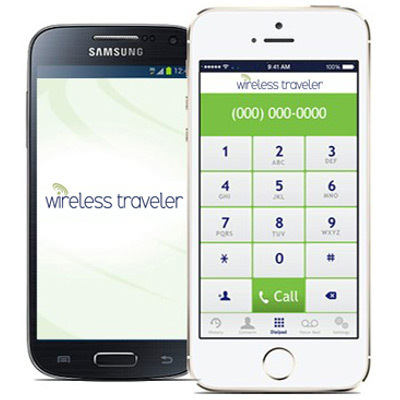 To call those stuck back home, use the low-cost Wireless Traveler WiFi Calling App (free from iTunes or GooglePlay). Call are just two cents a minute or free app to app.